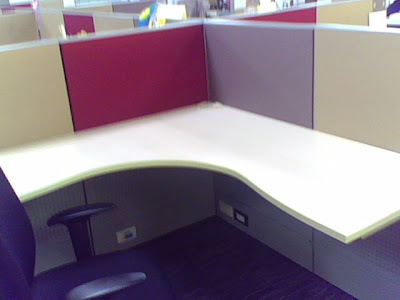 Recently, you have witnessed how I say goodbye to my previous workstation. 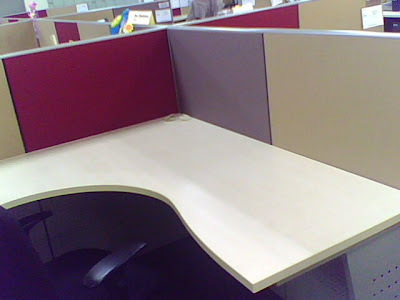 Now, join me again as I transfer to my new working area! 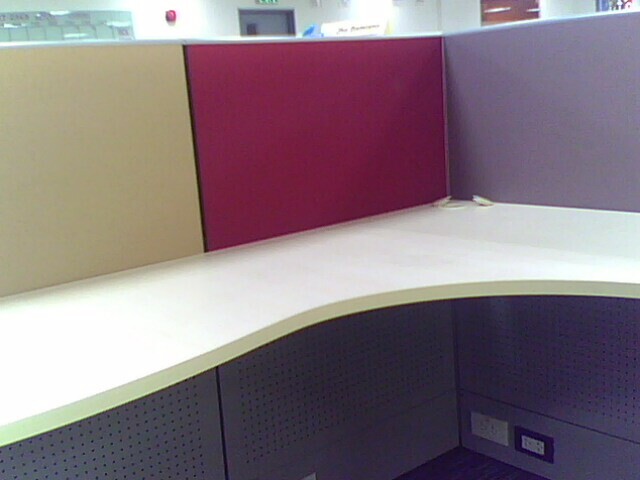 Well, to give you a more detailed documentation of my new working area, I decided to divide my post into two part. For the first part, I will let you see the plain working area before I transfer. And then of course for the second part, I will let you see the renovated one. The working station that I already designed! So, let's proceed to the Part I.
Yeah, as you can see, it's plain and simple! This is my new area before I transfer! Look at it...it's very very clear and simple! It is surrounded by colorful walls. The color of the walls were just blended with the lights. It's so nice and friendly to the eyes! Unlike my previous workstation, it is wider. I can move more freely with it. But then, it is more expose to others than my previous. Hmmm....some of my secrets will be reveal here if this is an open area! Haha...! Look at it from top to bottom, side by side. What can you say? Do you like it as plain as is? Or you missed my accessories!? What can you suggest to improve its looks? Aside from its fair appearance, another thing that I can share with this new area is its environment. Besides having more other neighbors from the other area, its air-condition is truly cold! Yeah, twice the coldness from my previous station! Oh I need now to wear many jackets! I can't take the cold! Again, have your final shots in my new workstation 'coz later you would see how it will transform into a new artistic one! 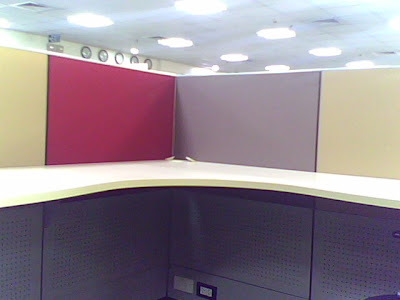 I suggest you install all the walls of your cubicle with mirrors so you can see your face wherever you look.